I’m a chocoholic … I admit it. But, when you are allergic to peanuts and tree nuts, safe chocolate can be hard to find. I have spent countless minutes in the grocery aisle reading the labels on chocolate-based products. Did you know the packaging can affect a product’s safety? For instance, Hershey’s Nuggets and Kisses are produced in facilities that also produce nuts, but the regular-sized Hershey bar is not. 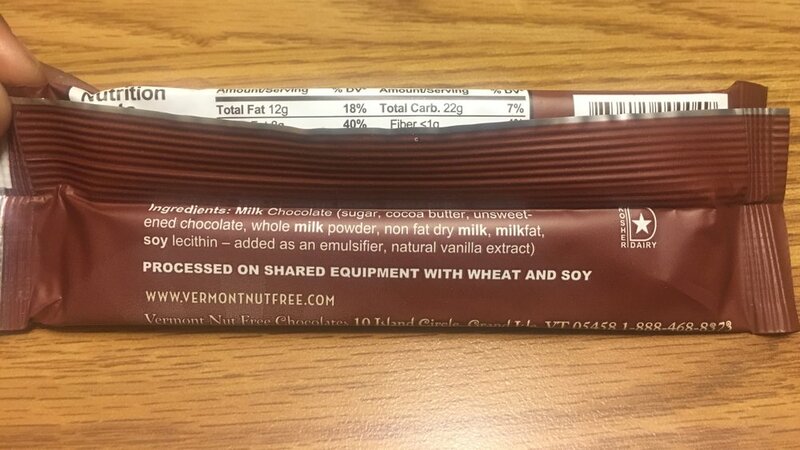 I was glad when I came across Vermont Nut Free Chocolate. They provide products that are guaranteed safe. In fact, they have a Nut Free Statement on their website that reads: “Our entire selection is completely safe for those with any tree nut or peanut allergy. Our products are produced and packaged in our dedicated nut free facility. We work closely with sources to ensure that our raw ingredients are peanut and tree nut free and are also produced in nut free facilities.” After reading this, I had to try it. They have a huge array of products (some not chocolate) ranging from hot chocolate to trail mix to gummy candy. I tried the Milk Chocolate Bar and Milk Chocolate Drops. They were delicious! The chocolate wasn’t too rich but was certainly high quality. My only wish is that the products were more budget friendly, but safety comes with a price tag. Vermont Nut Free Chocolates can be purchased on their website or at various grocery stores across the country. Enjoy!